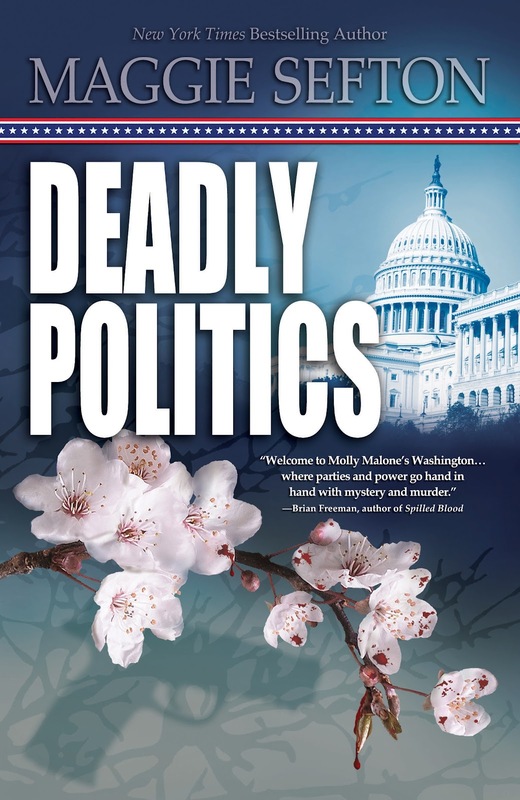 Today, I thought I would share a short excerpt from DEADLY POLITICS, so readers could meet Molly Malone in person as she's returned to her hometown of Washington, DC, to start her new job working for the newly elected Independent Senator from Colorado, John Russell. Enjoy! “Sure thing, Molly. Be back in a sec,” Ryan said, scurrying towards the kitchen. I had to smile. “That was really good of you, Casey. At least you got Jed away from Karen. Thanks for that.” I looked around the room but didn’t see Karen. Still making phone calls, I figured, as I checked my watch. Nearly eleven o’clock. “When will these people leave?” I whispered to Casey. “Whoa, thanks for sharing,” I said and laughed all the way to the library. Ryan caught up with me at the doorway. “I spied a few cookies, so I grabbed those, too,” he said as I gratefully accepted the ceramic mug of coffee. Steam wafted off the black brew, tickling my nose. “Oh, in another half hour, probably. See you later, Molly.” He was already halfway out the door. There was Peter’s folder on the desk, so I took a deep drink of coffee and pulled the phone from my pocket. I stood, paging through Senator Russell’s dinner schedule and munching cookies, while I dutifully entered the dates on my electronic calendar. I did notice that with the exception of this weekend, Russell did the majority of his entertaining during the week, clearly leaving weekends free for return trips to Colorado. I’d been impressed with his regular attendance to his home state and constituents. Smart man. I smiled as I read. “Congeniality, huh? I never pegged you as an optimist, Peter.” Spotting a couple of names, I said, “Now that you mention it, you might want to separate these two.” I pointed to the names of two Western congressmen. “Why’s that?” Peter asked, peering over the list. I didn’t hear the rest of Senator Russell’s plans. Another list had caught my attention and another name. I stared at this name. Congressman Edward Ryker. I didn’t have to search for this face. It rocketed from the back of my mind and out of the past. The past I’d tried so hard to bury. Old memories seared through me, cutting off my breath. Finally, Peter’s voice pierced the fog. “At eleven thirty, I hope that’s a girlfriend,” I said, following after him. I’d had enough of schedules and lists and names for tonight. I drained the last of my coffee as I headed down the hallway and glanced about the nearly empty living room. No sign of Karen. Was she still making phone calls? Good Lord. That girl had one heckuva contact list. I glanced into the kitchen and saw a remnant of the catering staff finishing up. Wiping down the counters. The evening was wrapping up at last. “Yes, indeed,” Casey said, walking slowly to match the elderly man’s stride. Lamp light and lanterns cast enough light to illuminate the yard, and I raced down the steps, shivering in the chill spring night as I headed for the gate. Summer’s heat had yet to come. My luscious silk jacket felt cold against my skin, and I rubbed my arms while I walked, wishing I’d chosen the new suit for tonight. Reaching the outside sidewalk, I searched the narrow residential street for Karen’s car, but most of the cars looked the same in the dark. I walked along the sidewalk, peering into the vehicles, expecting to see Karen sitting in her Honda, still negotiating on the cell phone. “About an hour ago. Her car’s a little farther down, Molly,” Albert said as he assisted the woman into the passenger seat. I kept walking and peering into the darkened cars. Georgetown streets were tree-lined and shady. Great during the day, but dark during the night. Tall streetlamps cast shadows as well, tricking you into thinking you saw someone in a car when you didn’t. Finally I spotted Karen’s car, and there she was sitting inside. She must still be talking and negotiating. Talk about a work ethic. Just like all of the Graysons. For some reason she didn’t answer, so I leaned over and knocked on the window to get her attention. She was looking straight ahead. That’s when I saw it. The blood. Blood on her face. On her hair. On her clothes. I stared at the blood. At Karen. Sitting so still, looking out the windshield. I blinked. The night shadows were still playing tricks on me. That couldn’t be blood. . . .